Type azcopy /? for help on AzCopy. 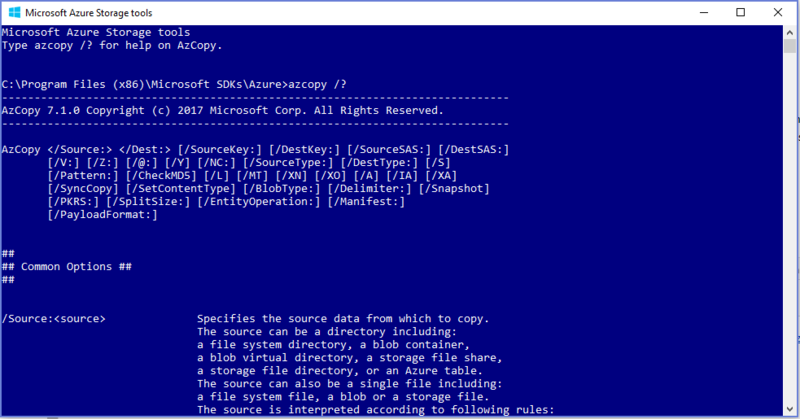 C:\Program Files (x86)\Microsoft SDKs\Azure>azcopy /? AzCopy 7.1.0 Copyright (c) 2017 Microsoft Corp. All Rights Reserved. /Source:<source> Specifies the source data from which to copy. a storage file directory, or an Azure table. a file system file, a blob or a storage file. the source will be interpreted to a directory. the source can be a single file or a directory. the source will be interpreted to a single file. /Dest:<destination> Specifies the destination to copy to. is interpreted as a single file. is interpreted as a directory. a SAS must be provided. service or between two different accounts. generates a new journal file. matches the command line in the journal file. /@:<parameter-file> Specifies a file that contains parameters. begin with the # symbol. You can specify multiple response files. /Y Suppresses all AzCopy confirmation prompts. /NC:<number-of-concurrent> Specifies the number of concurrent operations. environment, running in the storage emulator. /S Specifies recursive mode for copy operations. pattern, including those in subfolders. and the presence of the recursive mode option. Recursive mode is specified via option /S. matched against files within the directory. files in any subfolders beneath the directory. in all the other cases. perform the MD5 check when downloading data. to be the same as the source blob or file’s. same or older than destination. or files among two Azure Storage end points. 1) Copying from Blob storage to Blob storage. 2) Copying from File storage to File storage. 3) Copying from Blob storage to File storage. 4) Copying from File storage to Blob storage. block blob, a page blob or an append blob. delimit virtual directories in a blob name. from an Azure blob container or virtual directory. blob container or blob virtual directory. By default, snapshots are not copied. increases the speed of the export operation. uses a single thread to export table entities. /SplitSize:<file-size> Specifies the exported file split size in MB. export table data to single file. | InsertOrReplace> Specifies the table data import behavior. operation for locating the data files. /PayloadFormat:<JSON | CSV> Specifies the format of the exported data file. AzCopy exports data file in JSON format. 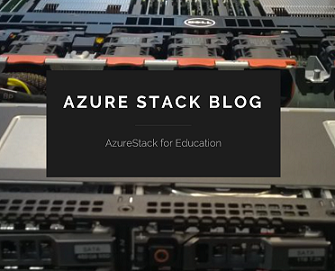 Categories: ARM, Azure, Azure Stack, Containers, Microsoft Azure, Windows 10, Windows Containers, WindowsAzure | Tags: AzCopy, Azure, AzureStack, AzureStorage, Cloud, Microsoft, Storage | Permalink. 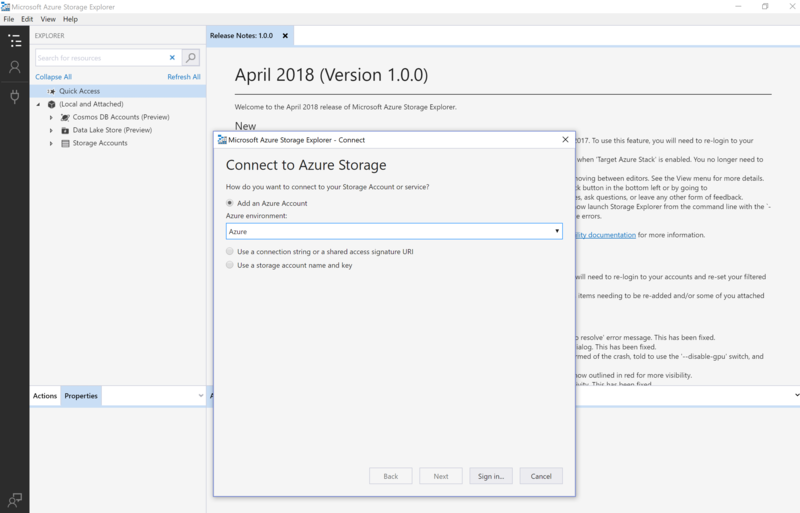 Welcome to the February 2018 release of Microsoft Azure Storage Explorer. o Create and manage snapshots for your File Shares. o Easily switch views between snapshots of your File Shares as you explore. o Restore previous versions of your files. o Connect to your ADLS resources across multiple accounts. o Connect to and share ADLS resources using ADL URIs. o Perform basic file/folder operations recursively. o Pin individual folders to Quick Access. Azure Storage Explorer (Preview) is a standalone app that enables you to easily work with Azure Storage data on Windows, macOS, and Linux. 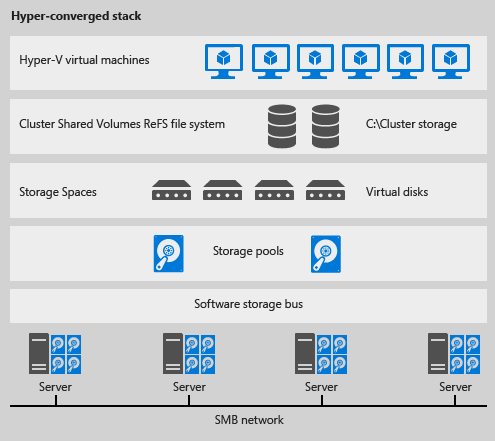 In this article, you learn several ways of connecting to and managing your Azure storage accounts. Azure File Sync (preview) allows you to centralize your organization’s file shares in Azure Files without giving up the flexibility, performance, and compatibility of an on-premises file server. 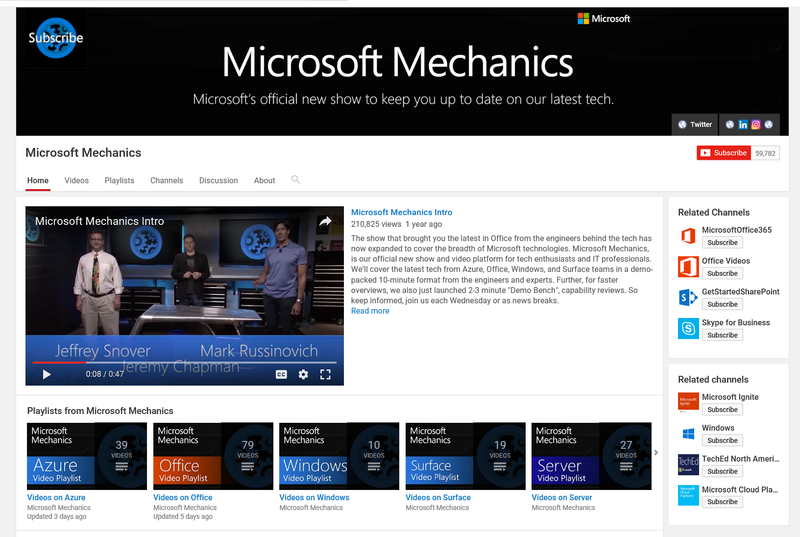 It does this by transforming your Windows Servers into a quick cache of your Azure File share. 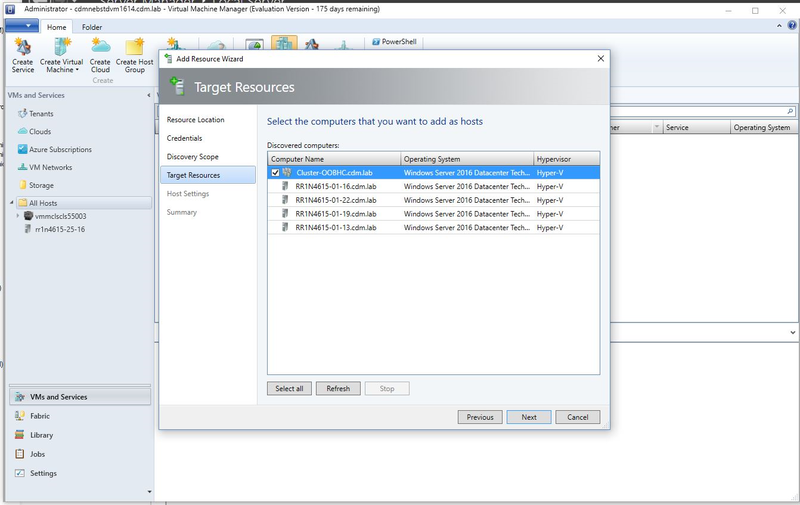 You can use any protocol available on Windows Server to access your data locally (including SMB, NFS, and FTPS) and you can have as many caches as you need across the world. Categories: Azure, Azure Stack, WindowsAzure | Tags: Azure, AzureStack, Cloud, DevOps, Explorer, FileShares, Linux, Microsoft, Storage | Permalink. Storage Explorer 0.8.9 will automatically download the latest version for updates. Hotfix: using a portal generated SAS URI to attach a storage account would result in an error. You can now create, manage, and promote blob snapshots. You can now sign in to Azure China, Azure Germany, and Azure US Government accounts. You can now change the zoom level. Use the options in the View menu to Zoom In, Zoom Out, and Reset Zoom. Unicode characters are now supported in user metadata for blobs and files. The next version’s release notes can be viewed from the update notification. You can also view the current release notes from the Help menu. While zoomed in or out, the zoom level may momentarily reset to the default level. Quick Access only works with subscription based items. Local resources or resources attached via key or SAS token are not supported in this release. It may take Quick Access a few seconds to navigate to the target resource, depending on how many resources you have. Having more than 3 groups of blobs or files uploading at the same time may cause errors. 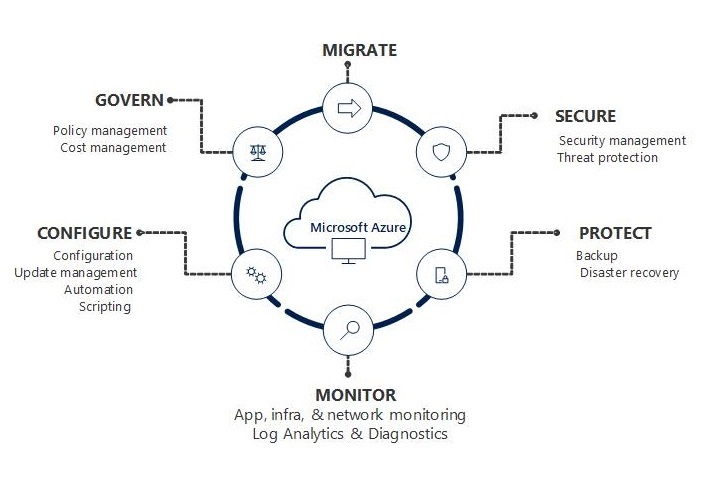 Categories: ARM, Azure, Azure Security, Azure Stack, Microsoft Azure, WindowsAzure | Tags: Azure, AzureStack, Cloud, Microsoft, Storage, Tool | Permalink. 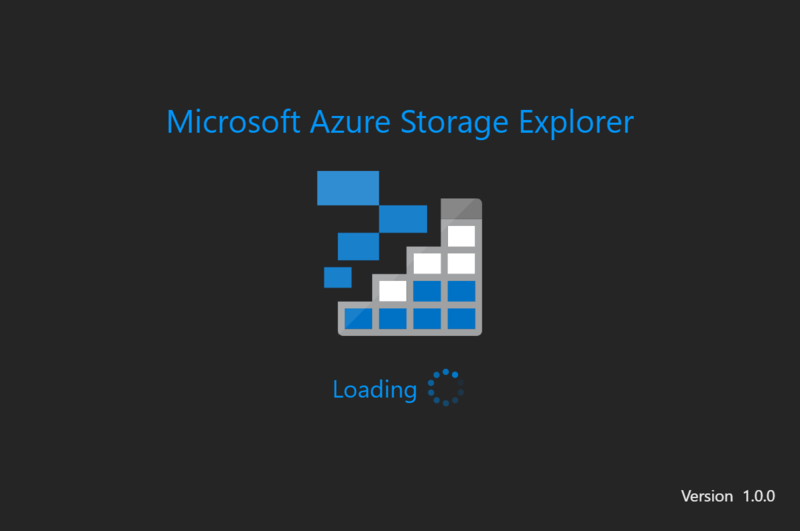 Microsoft Azure Storage Explorer is a standalone app from Microsoft that allows you to easily work with Azure Storage data on Windows, macOS and Linux. 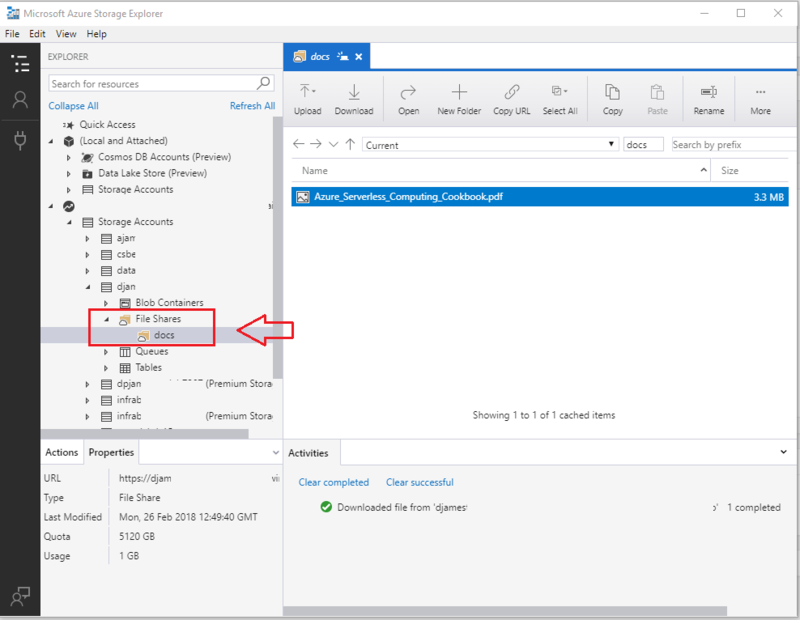 Storage Explorer will now automatically download the latest version when it is available. Categories: ARM, Azure, Azure Security, Azure Stack, Microsoft Azure, WindowsAzure | Tags: Azure, AzureStorage, Cloud, Explorer, Microsoft, Storage, Tool | Permalink. Categories: Azure, Hyper-V, Windows Server 2016 | Tags: HyperV, Microsoft, S2D, Storage, WindowsServer2016, winserv | Permalink. Categories: Hyper-V, System Center 2016, Windows Server 2016 | Tags: HyperV, S2D, SCVMM, Storage, sysctr | Permalink.